My family is not a sports family. This must be fully understood before I proceed with discussing the events of Special Olympics. *That last one is an exaggeration. I swear, I never actually meant to hit my brother, Justin, on the head with a croquet mallet. Yet, the scar he bears nearly twenty years later says otherwise. We earned awards in school for academic excellence, not sports. We were straight A students who stayed inside and read. Yet even with all our book smarts, if placed on a sports field we would appear as if we were strangers to this planet. Despite the simplicity of some sports (ball goes in hoop, ball goes in net) we would stand, legs shaking, and run from the ball, rather than to it. Somehow Jonathan, the youngest of our family, has managed to participate in sports ranging from bowling to volleyball to swimming. He doesn’t shy away from being active, but rather, revels in it. While I would rather hide behind my computer screen writing, Jonathan jumps at the opportunity to dance, swim, and participate in any kind of group activity available. 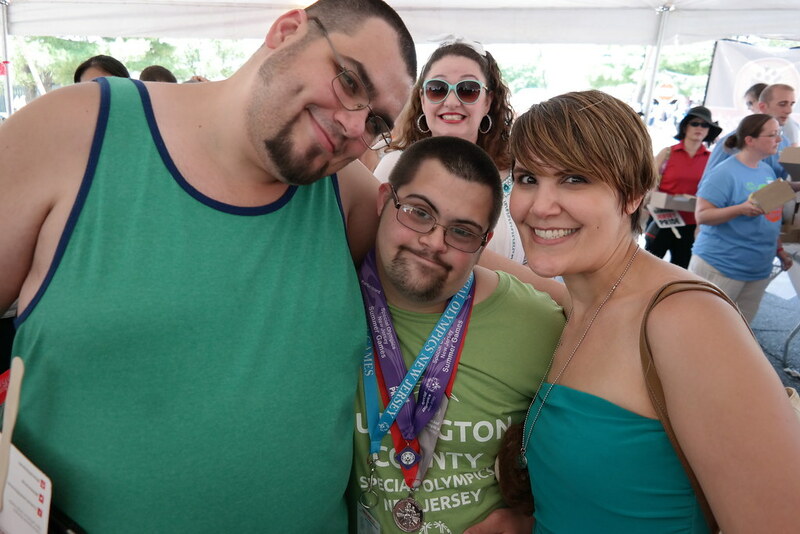 Special Olympics hasn’t just been an outlet for Jonathan’s energy and excitement, it has been a motivator for our entire family. 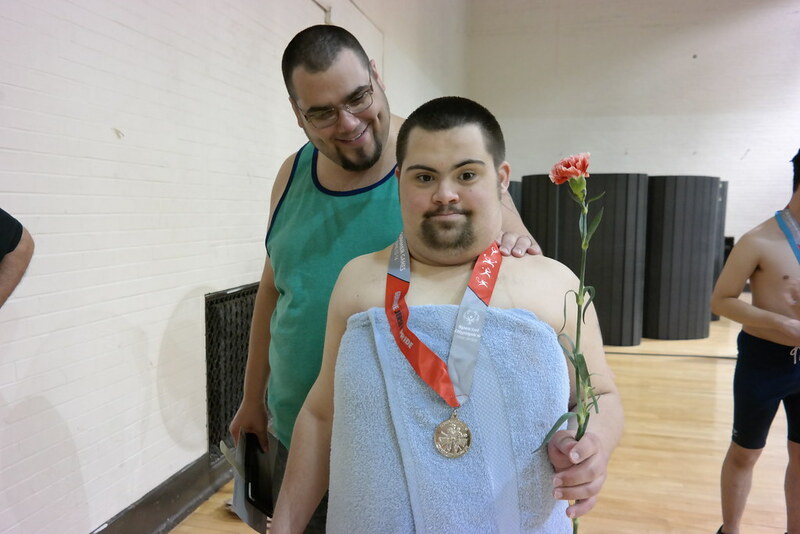 It has awakened within us a sleeping sports fan, and made us into enthusiasts for not only Jonathan’s sport but all sports linked to and represented at the Special Olympics. I don’t think I can paint a clear enough picture of what the events of SONJ Summer Games are like. The campus of TCNJ is crowded with families, athletes, and volunteers. Getting into the parking garage requires at least fifteen minutes of patience because of the vast amount of cars lined at the entrance. Every athlete is a star that day. 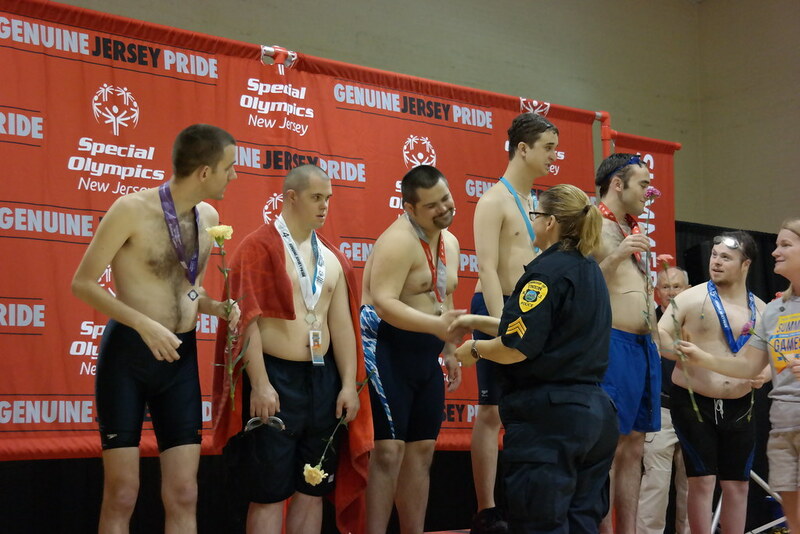 It doesn’t matter what place an athlete took, they are all presented with a medal by local law enforcement. 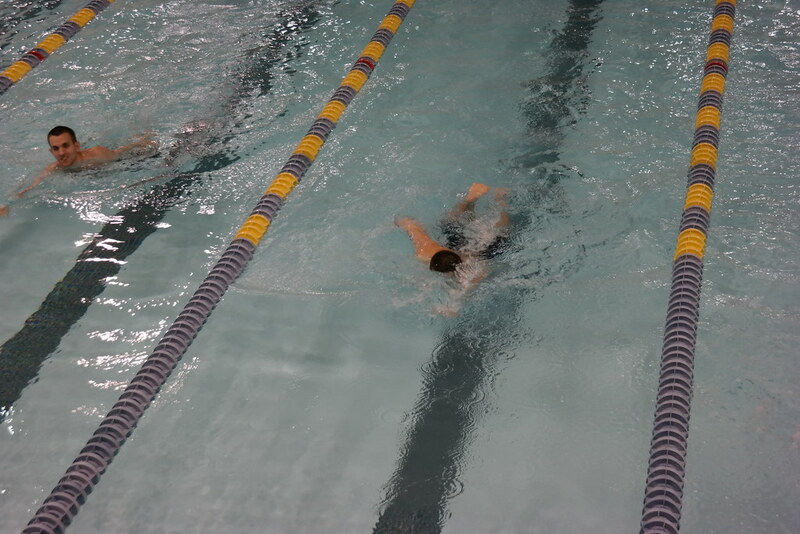 Jon’s first race, the breaststroke, he came in first, but both he and the other competitor did something to garner a ‘Participation Award” instead of a medal. Jonathan could care less, as perhaps you can tell by his face. His second swim of the day. freestyle, he hustled his little booty back and forth for his 50 meter swim. With five other competitors, we weren’t sure what to expect. Our boy pressed on and in the end took second place. I should note here that there have been years that our boy has decided to become a ham during the race. 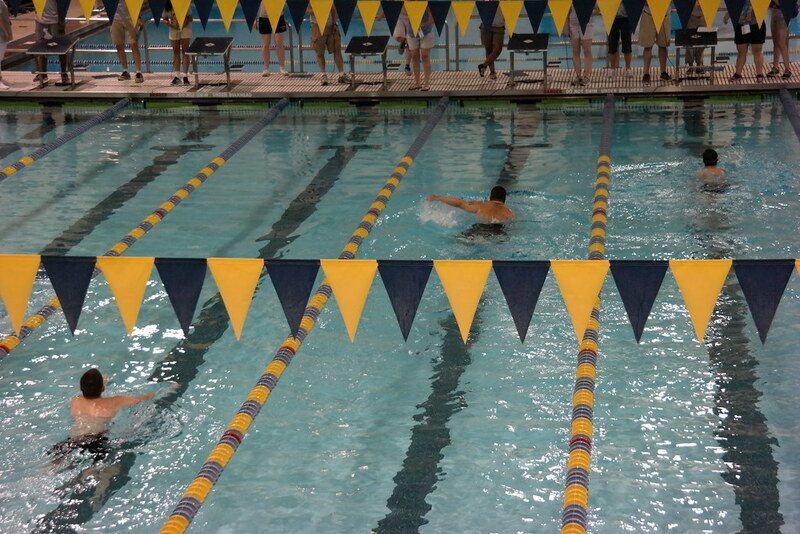 Instead of pushing himself to the finish line as quick as possible, he would look up at our family in the stands and smile or wave all while he should have been swimming. It would be a lie to say I don’t slightly miss that little show off. I can’t handle the cuteness! 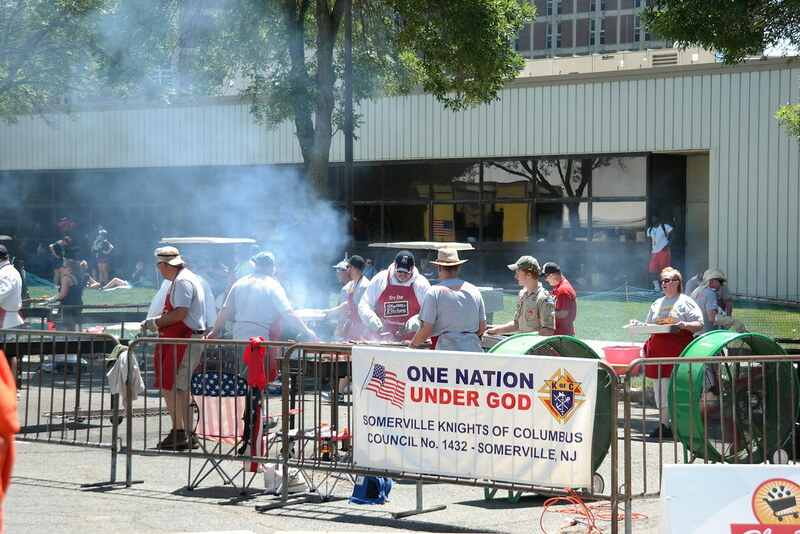 Somerville Knights of Columbus barbecued hot dogs and hamburgers for all SONJ athletes and attendees. 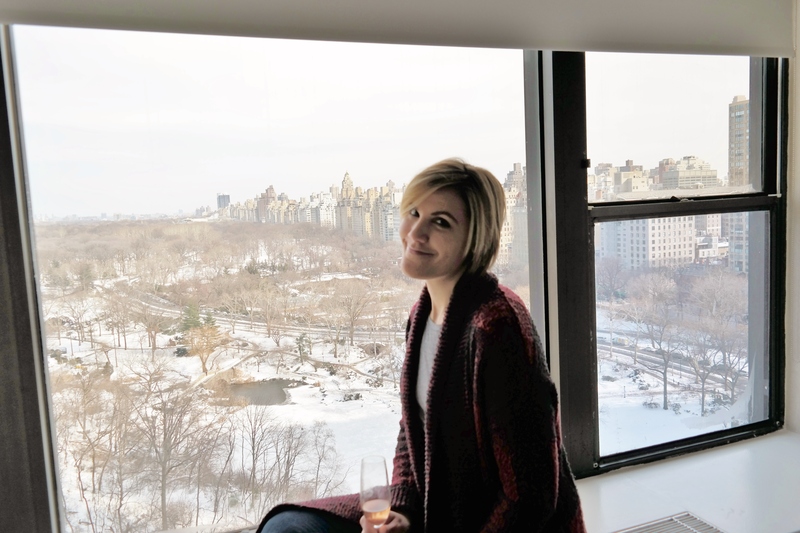 Please note it was 90 degrees and there is a man in a hoodie in this picture. This is another part of the SONJ events that I feel doesn’t get enough recognition. ShopRite donates hot dogs, hamburgers, salads, fruits, waters, granola bars, chips, and more and it is served for free to anyone in attendance. A tent outside of the aquatics building is open for a two-hour window and anyone may come through, as many times as they would like, for food. If Shop Rite didn’t already have some of the best prices around, this alone would make me a loyal customer. 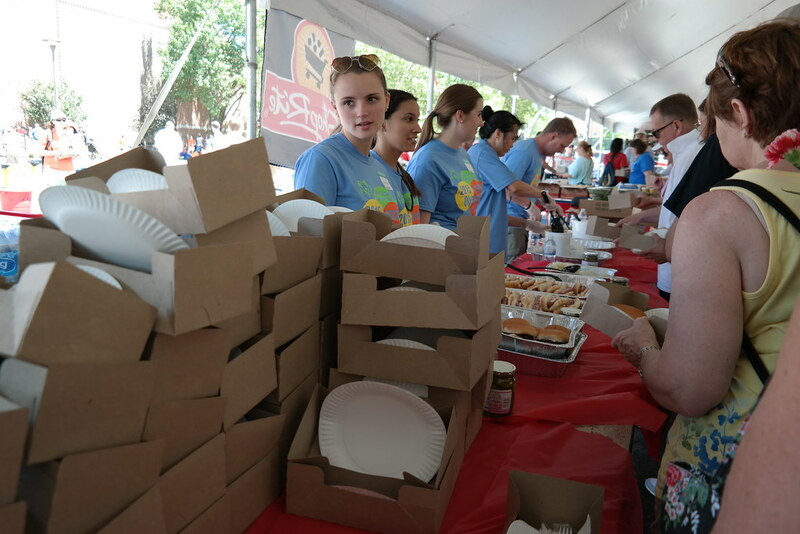 Volunteers are lined up behind dozens of tables set with boxes for visitors to fill with as much food as they desire. I also need to note here that not one person has a bad attitude, nor is one person curt, but rather they are friendly and accommodating to every single person. Special Olympics is not just something I randomly choose to attend, it is an integral part of my life. The weekend is one I wouldn’t miss for anything in the world. The pure joy, the unusual friendliness of everyone encountered, it is all something I wish could be brought over to ordinary life. I often tell people to come to SONJ and just walk around. After a brief moment among such company. and your world view can’t help but be changed. Suddenly something that so many think is broken, becomes what is actually right in this messed up world in which we live. Excellent write up…Way to go Shop rite my #1 store the best in everything,especially Special Olympics!! !